Executing a well-flown short-field landing proves that a pilot has learned and can combine numerous flying skills. But don´t judge how well you flew the maneuver strictly by its gratifying completion: Touching down at minimum control airspeed, at or within 200 feet of a specified point, as mandated by the Private Pilot Practical Test Standards. 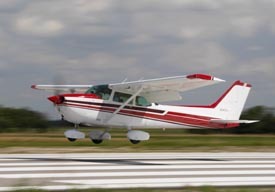 A good short-field landing is a specialized procedure that results from a stabilized approach, with the aircraft properly configured and trimmed for the recommended airspeed. This allows the pilot to use small adjustments of power or pitch to ensure a successful outcome. Once mastered, a short-field landing isn´t something to save for the flight test or occasional practice flights to smaller airports. Use it on a cross-country flight if you must land on a longer, intersected runway. Executing a short-field landing could also help if air traffic control requests you to "expedite" (see the Pilot/Controller Glossary in the Aeronautical Information Manual), allowing you to exit the runway at a taxiway close to the approach end. Before selecting a short-field landing for a given situation, you need to know what is reasonable to expect from your aircraft—and yourself. Study the pilot´s operating handbook, then add a safety margin allowing for pilot experience and performance-eroding aircraft wear and tear. If the approach must overfly an obstacle, consider adding a safety margin such as the "50-50 Solution" offered in the AOPA Air Safety Foundation´s Safety Advisor Ups and Downs of Takeoffs and Landings. In all cases, be ready to perform a go-around (the subject of the July 25, 2003 "Training Tips") if the approach is not working out as planned. Add short-field landing skills to your bag of tricks and see your piloting confidence grow!